In order to enter nest record and observation data, you'll need to have an account and be logged on. Click here to become a partner. Being logged into your account has other benefits as well, such as access to certain documents and publications that are restricted to use by partners only. Read about installing and monitoring your nest box. Collect information on your nest characteristics, dimensions, and location before you begin to enter the data into the website. Record this information on a data collection sheet, found here. Likewise, take the data collection sheets with you when you monitor your boxes and write down your observations immediately after checking the box. Bring your completed sheets to the computer when you are ready to upload your data! 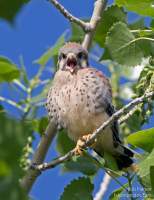 Remember: Monitoring and inputting your data consistently – even when kestrels don't use your box – is critical. We collect data on nest boxes and observations. 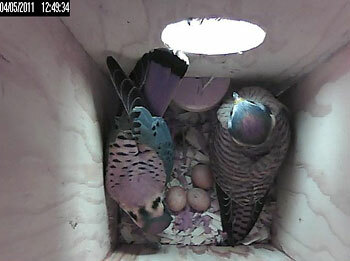 Therefore, you will first need to create a nest record for each box you monitor. You should do this as soon as you've installed your box. Once your nest records are created you can log all of your observations for each nest. To create a nest record, while logged in to your AKP account, select Research > Nests. To enter observations for your nests, select Research > Observations. Click here to download step-by-step instructions on Creating an Account, entering Nest Record Data and Observation Data.